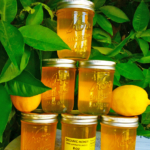 Desert Flower Honey, our top-selling honey, is produced by Africanized killer bees feeding on the desert flora of the Arizona Indian Reservation. Enjoy this honey on a slice of toasted, whole grain bread spread with Irish butter. Beautiful amber color, amazing taste, amazing purity, a pleasure to eat, no other honey I’ve had comes close to the honeys being produced here.